Fugees were handed a lifeline after their 1994 debut album Blunted on Reality was a critical and commercial disappointment. Give complete creative control and an advance to make the album they wanted to, the band – Wyclef Jean, Lauryn Hill and Pras – set up a studio in Wyclef’s uncle’s basement. The end result was The Score, one of the most ground-breaking and important rap albums of all-time. It sold over 6 million copies in the US alone and was certified 5x Platinum in the UK. The album has is being reissued on vinyl as 2LP set by Sony Music CMG just over 22 years on from its initial release. 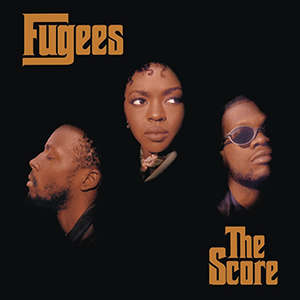 The Score contains the trio’s biggest hit, a cover of Killing Me Softly, which interestingly isn’t representative of the rest of the album at all. While Hill does use her incredible singing voice throughout album, Killing Me Softly is the only track where she sings for the entirety. It’s such a clever twist on the classic song as it gave it a contemporary urban beat whilst retaining the soul of the melody and lyrics. The Score opens with a spoken word intro, Red Intro, by Red Alert and Ras Barake, and it sets the tone for the record. One of the things that was so refreshing about Fugees was their refusal to give in to the rap clichés of guns, blunts and women. They didn’t represent the ‘thug life’ style of many of their contemporaries, instead crafting songs about society and life in America as black people. The trio also allowed each other to shine and they all contribute something to every single song. The first song on the record is the beat-heavy How Many Mics and it’s a tight rhyme-spitting number that sees the trio hitting back at their critics while showing off their skills. It’s a stop and take notice moment that throws you into their world and catches your attention. Hill also takes some shots at contemporary artists at the time that she believed to be mediocre in terms of their talent. It’s bold, brash and confident, three things that Fugees keep up throughout the entire record. The band uses clever samples throughout The Score such as I Only Have Eyes For You by The Flamingos on Zealots and God Made Me Funky by The Headhunters on The Beast. They seamlessly weave the samples into their own instrumentation and beats. Ready Or Not contains three samples (one of which is an Enya track) and it remains one of their most recognisable hits as they warn other rappers that they’re coming to claim their place at the top of the genre. Elsewhere on the record Wyclef takes lead on No Woman, No Cry, a cover of the Bob Marley classic, and the lyrics are slightly altered to reflect Brooklyn rather than Trenchtown. The catchy Fu-Gee-La features a fantastic vocal from Hill on the chorus and The Mask explores the idea that everyone wears a mask of some kind to hide parts of themselves from others. The vinyl reissue is pressed on limited-edition orange vinyl and features a double-sided black-and-white insert with the song credits and imagery from the original release. Fugees may have parted ways after the success of The Score but at least they went out on top. It says a lot when a band can make such a huge impact on the music industry in a relatively short space of time. The Score remains a masterpiece and the themes it explores are as relevant today as they were back in the 90s. This album was made for vinyl and the beats sound fresher than ever.